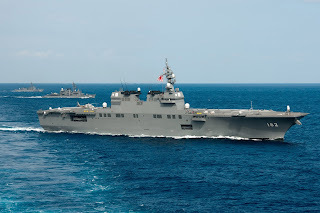 TOKYO, -- The Japan Maritime Self-Defense Force (JMSDF) officially announced plans on Apr. 5 to send its Ise destroyer into the South China Sea. The large helicopter-destroyer - actually a light aircraft carrier - is equipped with powerful anti-submarine patrol capabilities. While the ostensible purpose is participation in humanitarian training exercises led by the Indonesian Navy, the move also stands to provoke China, which has been on edge recently over US-Japan alliance pressures concerning the South China Sea. Japan’s Maritime Staff Office - the equivalent of South Korea’s Navy Chief of Staff office - announced on Apr. 5 that the Ise would be dispatched to the 2016 Komodo multinational training exercise spearheaded by the Indonesian Navy, as well as an Indonesian naval review. The Komodo Exercise, which begins on Apr. 12, will be staged in the waters around Padang, Sumatra, and involve training for humanitarian aid and disaster rescue operations. The Ise is to call at the Port of Subic in the Philippines, which is currently in a territorial dispute with China in the South China Sea, the Yomiuri Shimbun newspaper and other Japanese news outlets reported. One reason the Ise’s visit to the South China Sea is drawing major attention is due to its unique capabilities. The massive destroyer measures 197 meters in length and 33 meters in width with a standard displacement of 13,950 tons, ranking it second in scale only to the 19,500-ton Izumo in the JMSDF. It is also capable of carrying up to 11 SH-60J/K Seahawk helicopters - which can be used to track enemy submarines - and operating up to four simultaneously. Japanese news outlets said the Ise boasts the highest anti-submarine capabilities in the JSMDF. The US is currently struggling with tracking of Chinese submarines traveling to the West Pacific across the deep waters of the South China Sea. For that reason, the first request it made to Japan now that the latter has gained the ability to exercise collective self-defense authority was to share in anti-submarine patrolling in the broad South China Sea area. Japan had previously been cautious of such activities, citing the distance of more than 2,000 kilometers to the South China Sea from its JMSDF base in Naha, Okinawa. Further complicating operations in the South China Sea was the fact that its leading Japan Self-Defense Forces patrol aircraft, the P-3C and P-1, have respective cruising ranges of 6,600 km and 8,000 km. But the problems could be solved all at once if light aircraft carriers like the Ise or Izumo are positioned in the South China Sea. Another feature of the Ise is that its deck allows the arrival and departure of vertical take-off and landing aircraft. 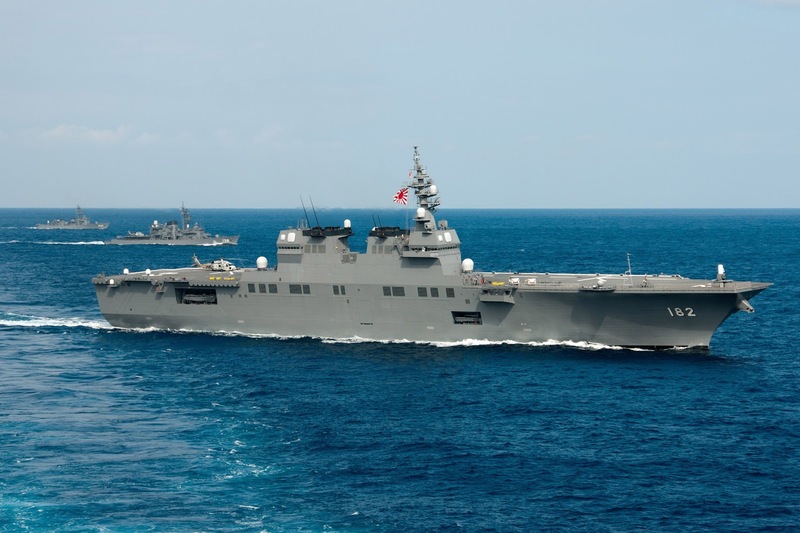 This means that if an emergency did occur in the US-Japan alliance, it could be used as a carrier for the US Marine MV-22 Osprey aircraft and the F-35B, considered a leading next-generation model. This fact in particular may explain why fueling and ammunition supplies for aircraft readying for takeoff were added among the “rear support” functions permitted to the JSDF in the amended security laws that went into effect on Mar. 27. In other words, the Ise provides a means of literally integrating the US and Japanese armed forces. The Japan Maritime Self-Defense Force (JMSDF) JS Ise (DDH-182) Hyūga-class helicopter destroyer escorted with two other JMSDF ships. The Hyūgas are primarily anti-submarine warfare helicopter carriers operating SH-60K anti-submarine helicopters.